Home Healthy MomsHealth & Exercise	Fill Up on Fish for a Brainier Baby! Are you avoiding fish in pregnancy because of concerns about mercury or confusing advice? It’s time to cast a second look at seafood—especially since it contains omega-3 fatty acids including DHA known to help your baby’s brain development. In fact, federal health experts say pregnant women and children need to eat more fish—not less! A 2014 report from the Food and Drug Administration (FDA) indicates that babies born to women who eat more seafood during pregnancy tend to have higher IQs—potentially 3.3 points higher—than those born to women who ate no fish. Brain-boosting DHA is found in high amounts in oily fish like salmon, herring and sardines. That’s why the Dietary Guidelines for Americans recommends that pregnant women regularly eat at least some fish that are high in DHA. How much fish should I eat during pregnancy and breastfeeding? Women and children should eat 8-12 ounces of lower-mercury fish a week, according to new FDA guidelines. That’s several 4-ounce servings a week. The American Academy of Pediatrics has also given women the thumbs-up to eat 12 ounces of lower-mercury fish while pregnant. But what about mercury in fish? Mercury in fish is often a concern of pregnant women. However, risk in the range of 8-12 ounces a week and even higher is very low, so you can feel confident eating the FDA-recommended amount. There are some fish to avoid during pregnancy (see below); some of these fish aren’t typically eaten frequently. 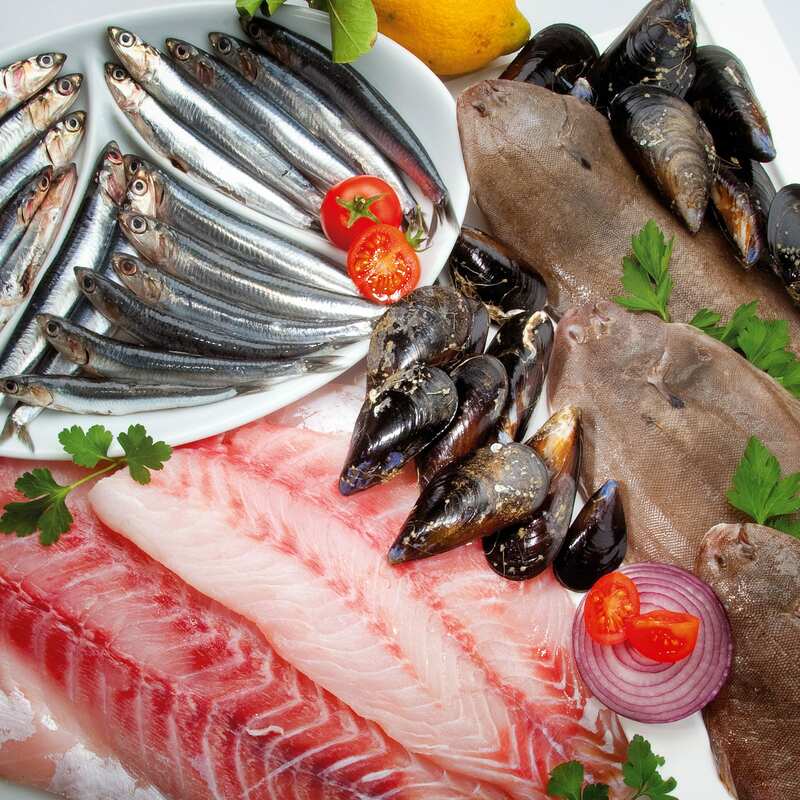 Eat a variety of seafood, and make sure some of your selections are high in DHA. Avoid shark, swordfish, marlin, orange roughy, tilefish from the Gulf of Mexico, king mackerel and bigeye tuna (used in sushi) —these are higher in mercury, and some are very low in DHA. Check local advisories when eating seafood caught by family and friends. If there is no advisory, limit these selections to once a week. Cook seafood thoroughly—fish should be opaque, flake with a fork and have an internal temp of 145°F. Clams, mussels and oysters are fully cooked when their shells open. Ask an expert: Should I take a DHA supplement? Also, “the research that has consistently shown brain-building benefits has all focused on fish consumption, which naturally includes DHA in addition to the other important nutrients in fish,” says Spiller, former director of the seafood program in FDA’s Center for Food Safety and Applied Nutrition. Note: Fresh fish are delish, but frozen, canned and pouch options are healthy, too. Fish = good mood food! “The nutrients in seafood are associated with less depression,” says Tom Brenna, PhD, a nutrition researcher and professor of Pediatrics and of Chemistry at the University of Texas at Austin. “Pregnant women should feel confident incorporating the recommended amount of seafood into their diets,” says Rima Kleiner, MS, RD, LDN, a registered dietitian (and mom of 2!). 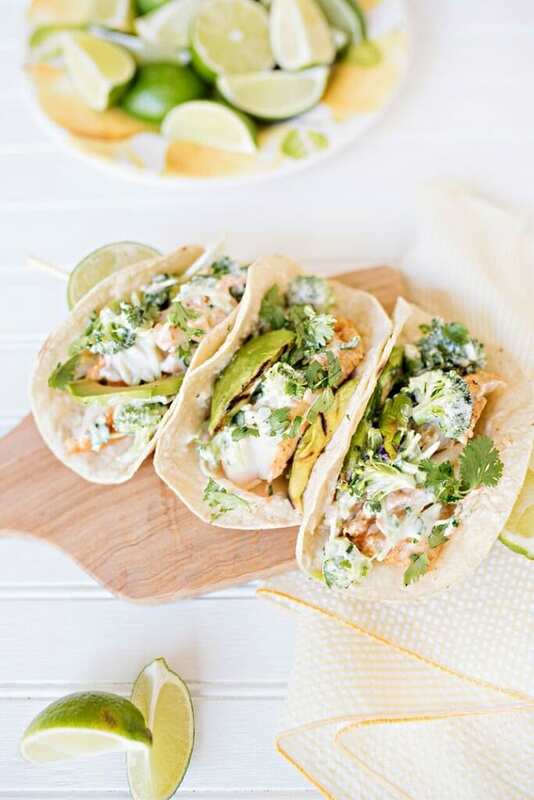 “It’s always good to eat a variety of foods, and your baby gets the brain-boosting bonus of DHA.” Rima offers up some yummy and easy recipes to help you slide seafood into your weekly rotation. These tacos practically cook themselves. Grill the fish and the avocados; top with broccoli slaw and a light lime-yogurt sauce. In a large plastic baggie, mix 1 Tbsp. olive oil, 1 Tbsp. lime juice, garlic, chili powder and cumin. Add cod and mix until fish is coated. Grill fish about 3 minutes per side, or until it flakes with a fork (internal temp of 145°F). Mix ½ Tbsp. olive oil and ½ Tbsp. lemon juice in a small bowl. Rub onto avocado halves and place face down on grill. Grill for about 2-3 minutes. Remove and cut in slices. In a medium bowl, combine remaining oil, lime juice and yogurt. Mix well. Add broccoli slaw, jalapeno and cilantro and combine until coated with yogurt-lime sauce. Top corn tortillas with grilled fish, slaw mixture and avocado slices. 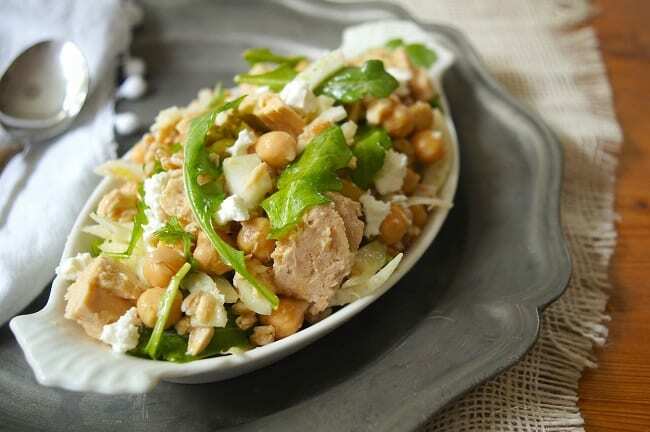 Tuna gets a Mediterranean makeover in this hearty whole-grain salad! If you don’t have farro, sub in 1½ cups cooked brown rice, barley, Israeli couscous or a different whole grain of your choice. Cook farro according to package directions. Drain any remaining cooking water and transfer farro to a large bowl. Flake tuna with a fork and add to bowl, along with chickpeas, fennel, arugula, olive oil, lemon juice, lemon zest, cumin and salt. Toss well. Spoon into a shallow serving bowl or small platter and sprinkle feta over the top. Serves 4 as a lunch entrée or 6 as a side dish.